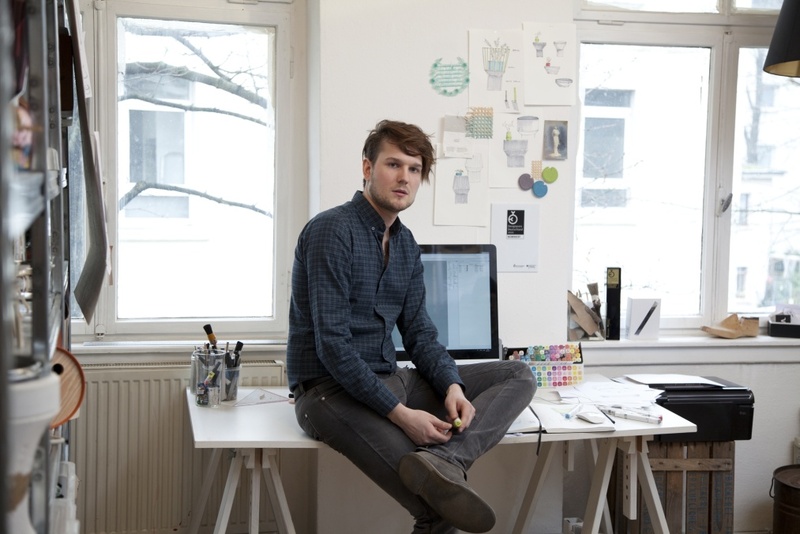 German designer Sebastian Herkner has collaborated with many of the top international furniture brands including Moroso, Classicon, and Pulpo—a remarkable feat considering his small studio consists of himself, an assistant, and the occasional intern. We've long admired his designs which feature deft uses of material and color. We sent a few questions his way to learn more about how he balances the creative and business sides of his operation, how he approaches collaborations, and how working for Stella McCartney impacted his design sensibilities. 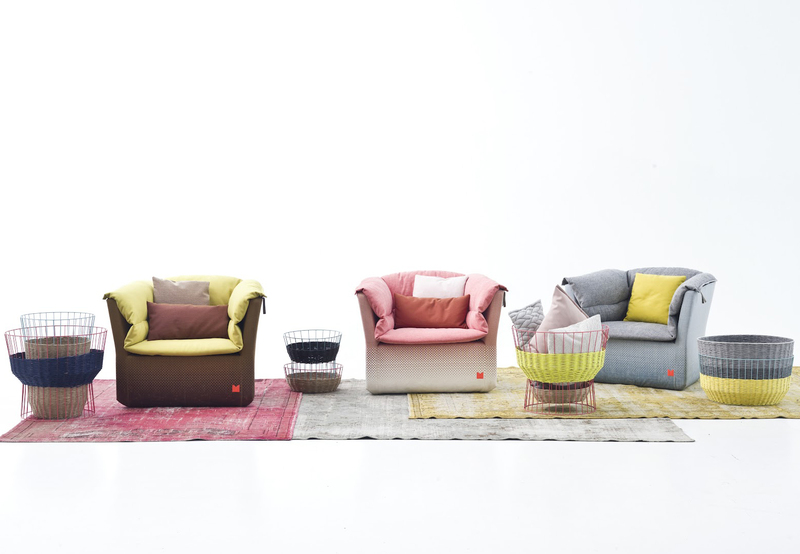 Coat armchairs and Bask storage by Sebastian Herkner for Moroso. 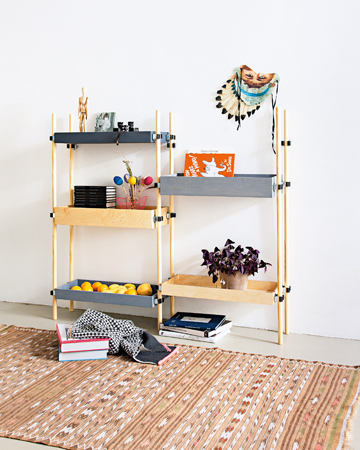 Transit shelves by Sebastian Herkner for SZ Magazin / Suddeutsche Zeitung. Bell table by Sebastian Herkner for Classicon. 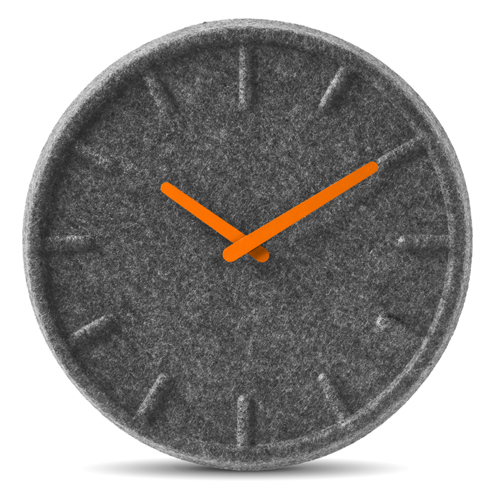 Felt clock by Sebastian Herkner for Leff Amsterdam. 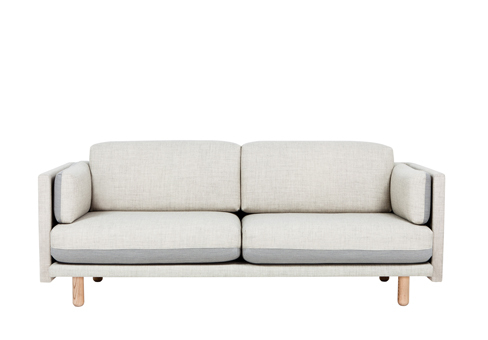 Arnhem sofa by Sebastian Herkner for De Vorm. What's a typical day like in your studio? How many people work for you? We have a big table in my studio. I sit on one side and my assistant Martin sits on the other. We are always working together, talking about the designs and their development. Then I also have interns joining the team from time to time. It is great to work together with people. What has been the biggest challenge in running your own studio? How much time do you allot to the business side of things? When I established my studio five years ago, I just got my diploma at the Offenbach University of Arts and Design. So I was educated in design but not in business administration. This is something I learn step by step. And of course I prefer the design process much more. Design is my passion—to think about the process to develop a solution, an object. This is a very responsible job. You've worked with an astounding number of European design manufacturers. How do these collaborations typically come about? Well, I got in contact with Patrizia Moroso at the Salone Satellite in Milan 2011. I was presenting there my project Bask—baskets made of paper yarn. She and her team passed by and she fell in love with them. After the fair we met in Udine and she asked me also to think about an armchair. This was actually the starting point of our collaboration. In 2012 we launched Bask as well as our new product Coat, an armchair. How do you balance the business side of your design studio with the creative side? Do you work more on one side versus the other? Do you manage both sides yourself? At the moment I do the business side by my self. Time to time my assistant supports me. When starting a new collaboration or project, it is important for me to go to another place to have time for thinking and the research. This is one of the most important steps when designing a product. I need—and also enjoy—these quiet moments. You have the responsibility to create something unique and sensible. Sometimes you come up quite fast with an idea and sometimes it takes a lot of time. At the end it is a fantastic feeling to get a smart idea. How did working for a global design brand like Stella McCartney help you figure out how to market your work? Well at 2003 it was not that global and established. I joined the team at the beginning when Stella had a small team and there were just three stores worldwide. Nowadays there are around 30 Stella stores worldwide and it has became one of the leading fashion brands. It was a great experience for me and a good opportunity to learn and to see behind the scenes at a running studio. Working in the field of fashion was new and a big source of knowledge and inspiration. The time I spent there is still essential for my work. I learned to work with colors and materials carefully and with patience. Regarding my projects today, I concentrate on colors and materials from the beginning. These concerns are always at the top of the design process—the material decides the engineering and production process. Do you come to a manufacturer with a concrete design idea, or do they come to you with the idea and ask you to design a piece that embodies the spirit? Actually both. Sometimes I come up with an new material or technology, or with an idea or concept of a new material or its transfer. Most of my works are material-driven. On the other hand, international companies sometimes ask me to design for them. In that scenario, it is always very important to visit the company and the people. I want to get in touch with them, understand their attitude and history before designing something for them. It is always a collaboration or even a relationship. Do you prefer to have a lot of constraints when designing an object, or do you like to start with a blank slate? It is important to know what the company wants to have, but it is not important to know what the company expects. That means that I need a kind of topic or a small brief. But then I want to convince them and also give them a unique and outstanding idea. You mentioned a difference in "slow" design vs. "fast design"—when companies to always need to manufacture new products and only expect them to be in production for a short amount of time vs. designs intended to endure. In what speed do you prefer to work? What is the longest (or shortest) time you've spent developing a piece of furniture? There are projects running for three years but also some just done in five months—it always depends and I like both. For me it is more important that the result is smart and has a perfect quality. I don't want to create trendy products; my aim is to make companions for your whole life. You mentioned that a designer never knows when they're going to make that piece that's pivotal to their careers. Can you expand on that notion? What of yours has surprised you with its success, or vice versa? Design and the success is not projectable. So there is no recipe. You always start with a sheet of white paper. And it is also difficult to say if there is a favorite piece. Products are the expression of feelings and passion of its time. So sometimes I like one thing, sometimes I like another of my designs more. What's your first step when it comes to designing furniture or lighting or other objects? I need paper, space, and silence. I think about the use, the needs, and the people. Who is the target group? Chairs are so different in each operation area. A chair in a cinema is different to a chair in a workshop or school. You have to observe the people, how they use the chair in the specific atmosphere. Do they sit? Do they lean against? Are they rocking? There are a lot questions to ask to get to the first idea. How have your aesthetic and material sensibilities changed over the years? In a visible way in the material shelf in my studio. I collect a lot of materials, crafted products, colors, and other interesting products. Being a designer has the nice benefit that you travel a lot and to amazing destinations. So I bought a cookie cutter in Sofia, a broom in Hanghzou, and scissors in New York. Sometimes I like the design, sometimes a detail, or a new solution in the connection of two materials. Who are some designers that you feel are getting it "right" either in terms of concept, aesthetics, or both? It is not easy to mention a specific designer, because there are many that I really like. For me it is always important that if a design is elaborate then each detail is smart and has a need. I am more interested in a design attitude and the honesty of the designer.